A flea infestation can be hard to eradicate fully, since the pests multiply very rapidly. If you don't want to use chemical treatment, try a Listerine home remedy first. As with most home remedies, the key to success is consistent application. Apply the Listerine treatment once a week and watch your flea population. It should decrease, but if it doesn't you will need to use chemical products or additional home remedies to win the bug battle. Scrub flea-infested pets with a Listerine shampoo. Mix equal parts of mild shampoo and Listerine in a bowl. Wash your pet (or yourself) with the Listerine shampoo. Get the animal wet all over, then scrub the modified shampoo over its fur. Concentrate on the "armpits" and the belly, since fleas like to hide in warm places. Let the shampoo sit for five minutes. Rinse the animal thoroughly. 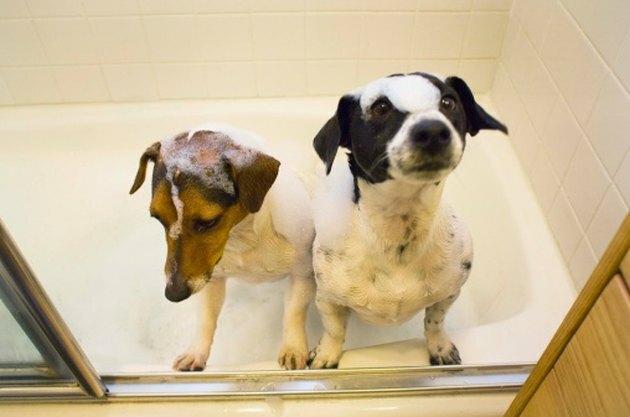 Since flea baths depend on how well you've saturated the fur with shampoo, you may need to repeat the bath to kill all the fleas if you accidentally skipped a spot. Dilute one part Listerine with six parts water. Pour the Listerine mixture into a spray bottle. Spray down animal, furniture and bedding with the Listerine spray to kill fleas.